I think I originally saw this idea in a Sunday supplement or a Good Food magazine but the concept was so simple I just looked at it and moved on so I couldn’t swear to either. However, wherever it came from I liked the idea, tweaked it a bit and made it even more delicious! I tend to just wing this recipe, it is flexible and forgiving in the extreme. It also microwaves well for lunch at work! It’s not the most attractive dish out there but it fills a gap and hits the spot wonderfully, excellent family grub! – Get your pasta on to cook and preheat the oven to 200C/Gas Mark 6. – Heat a splash of oil in a meduim sized pan. – Saute the onion and garlic for 3~5 minutes until soft. – Add the stock cube (crumbled), tomato puree and herbes. Give it a little stir. – Add the tinned tomatoes and passata. Stir thoroughly. – Simmer for 5-10 minutes. 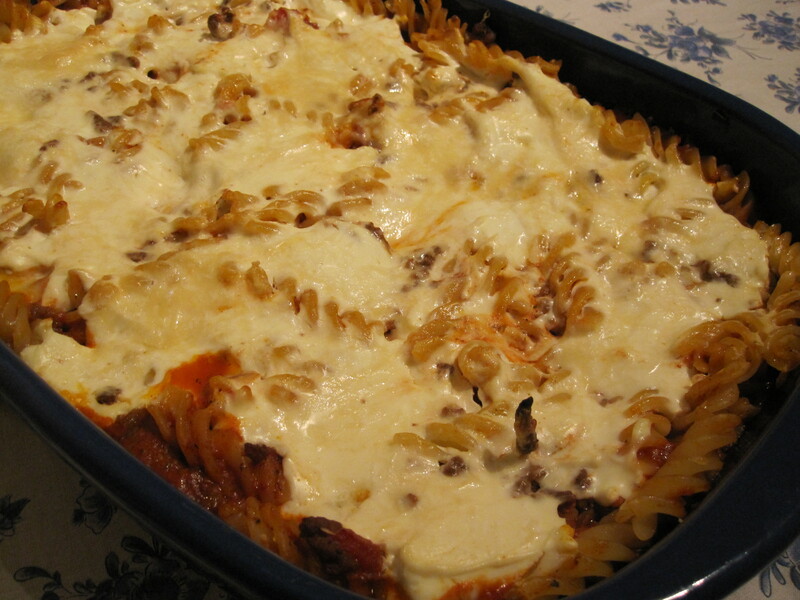 – Drain your pasta and tip it into a large casserole dish. – Pour the sauce over it and stir it about to coat the pasta in sauce. – Tear up the mozerella ball and dot chunks about amongst the pasta. 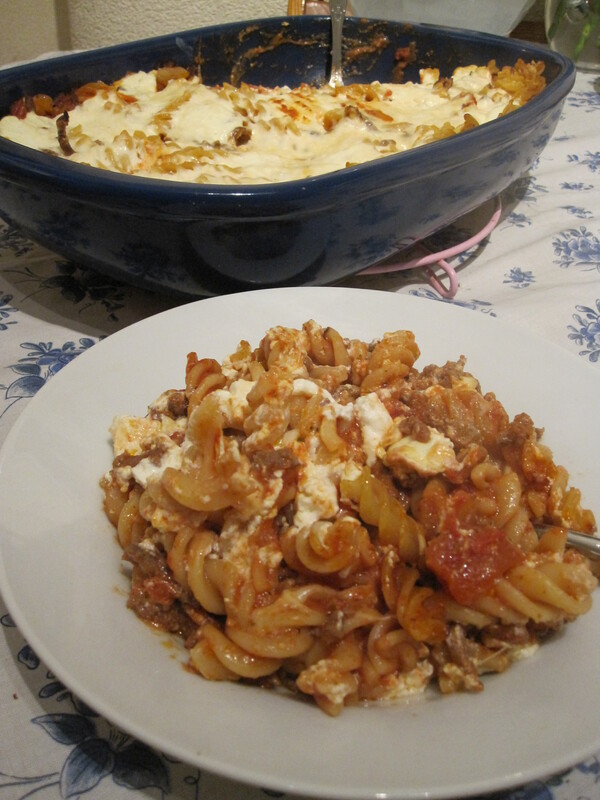 – Take a teaspoon and drop little spoonfuls of soft cheese amongst the pasta. – Spoon dollops of the creme fraiche over the top of the pasta then use the back of the spoon to smooth it evenly over the top. – Sprinkle the top with grated parmesan or cheddar. – Pop it in the oven and bake for 25 minutes.